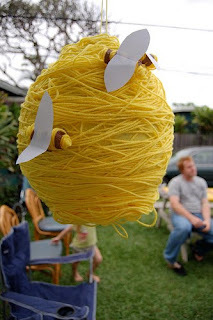 Very cute bee pinata from little b. This is so fantastic! Love it! Adorable! I like it as a lantern for a bee party. Wow - that's cool. I'm finding a lot of use for yarn in party decor! LOVES IT! yay! My friend told me that this got posted! Thanks! The pinata was actually really fun and easy to make! I love that pinata what a clever ideal!!! !